This sweet scene of a mother bird brings light and life to your home. Tending her nest from her wall socket perch, this sweet scene of a mother bird brings light and life to your home. When aglow, the luminescent glass mosaic fills a room with ambient colored light that is bright enough to illuminate obstacles, but soft enough to sleep through. The colorful, textured glass is made from 100% post-consumer bottle glass, kiln formed by artisans Vawn and Mike Gray. Handmade in Cape Coral, Florida. We chatted with Vawn and Mike about where they gain inspiration for their quirky collection of nightlights. (Hint: funny panda YouTube videos made the list.) Read the whole story on our blog. Unhappy with the processes and materials involved with making glass—Aerosol spray cans, toxic glazes, energy sucking kilns, miles of bubble wrap, and mountains of Styrofoam peanuts—Vawn and Mike Gray developed a process to create kiln-formed, fused, recycled bottle glass pieces. The kiln they use in their Cape Coral, Florida studio is a super energy efficient, computer-controlled fusing oven, turning out the colorful handmade pieces that become functional little works of art for your wall. Hold by plug, not by shade, to prevent unnecessary stress on light. Power Prongs do not rotate. Takes a standard incandescent 4-watt Night Light bulb (included). Love Uncommon Goods. I have purchased a few different items so far and have not been disappointed. The Customer Service is awesome too! I love the decorative look of this sweet night light in my guest bath. This was a lovely gift for a friend who needs night lights to get around at night. Upon receiving this nightlight, I wanted to try it out to make sure all was right before I wrapped it. I took it to the nearest outlet only to find that I couldn't fit it in my outlet (installed just 2 years ago when my kitchen was updated) in an upright position. The polarized prongs would fit only if I turned it upside down. For a nightlight this is a major design flaw. Even inexpensive Bath and Bodyworks items have a plug that is able to be turned to accommodate the polarized prongs of the plug. Given time I would have returned it. I was disappointed in the quality of this product. Lovely lights and exactly what I wanted. We love them for years to come on our new home. The nightlight was exactly as pictured and what I was hoping for. Works great as a nightlight. This is a wonderful nightlight in our kitchen. Like using recycled materials; great design as we are birders. Wanted to use it in the bathroom but it is too tall to fit below medicine cabinet in the only electrical socket. Bought this for my grandmother for Mother's Day, and she loves it! She put it in the room where she spends most of her day, and enjoys having it there when she watches tv. 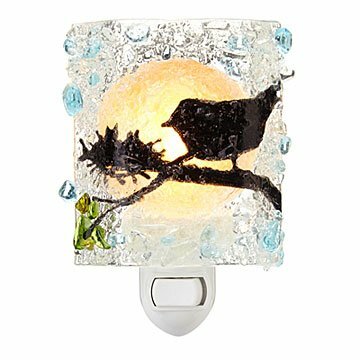 This nightlight is a beautiful work of art. I had purchased a nightlight by these artists at another site and already knew how beautiful their work is. So, I was thrilled to see that Uncommon Goods carries several of their nightlights. I definitely intend to purchase at least another either for friends and family or for myself.